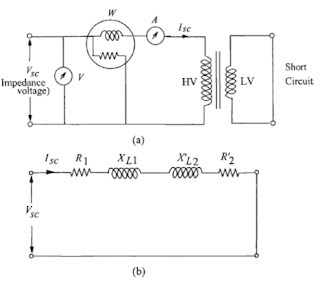 Open circuit test determines the parameters of shunt branch of the equivalent circuit of Fig. 1. - The input power measured by a wattmeter consists of the core loss and primary winding ohmic loss. - If the no-load current is 1% of full load current, ohmic loss in primary winding resistance is just .01% of the load loss at rated current; the value of winding loss is negligible as compared to the core losses. Hence, the entire wattmeter reading can be taken as the total core loss. The equivalent circuit of figure gets simplified to that shown in figure 2.
since the value of Xm is 500 per-unit. A short circuit test is done to measure the load loss and leakage impedance of a transformer. - In this test, usually the LV winding is short-circuited and voltage is applied to the HV winding in order to circulate the rated currents in both the windings; the voltage required to be applied is called as the impedance voltage of the transformer. For a transformer having 10% leakage impedance, voltage required to circulate the rated current is 10% of the rated voltage. 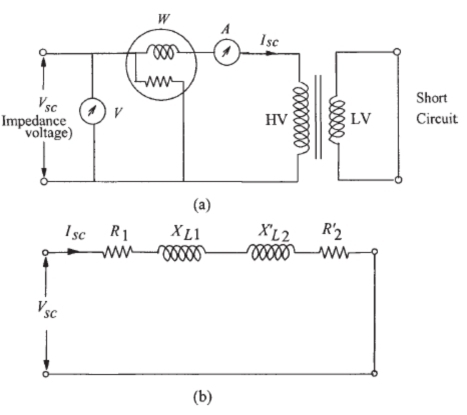 - The circuit diagram for short circuit test is shown in figure 3. (a), in which LV winding (secondary winding 2) is short-circuited. For an applied voltage of 10%, assuming for the equivalent circuit of figure 1 that the primary and referred secondary leakage impedances are equal, 5% of voltage appears across the shunt excitation branch. - With a no-load current of 2% at rated voltage, the current in the shunt branch for a 5% voltage is just 0.1% of rated current (assuming linear B-H curve). - Hence, the shunt branch can be neglected giving the simplified circuit of figure 3. (b) for the short circuit test. across the shunt excitation branch, it is just 0.25% of the core loss at the rated voltage. Hence, almost the entire loss measured by the wattmeter is the load loss of the transformer. - Req1 is the equivalent AC resistance referred to the primary (HV) winding and accounts for the losses in DC resistance of windings, eddy losses in windings and stray losses in structural parts. - It is not practically possible to apportion parts of stray losses to the two windings. 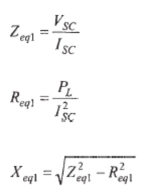 - Hence, if the resistance parameter is required for each winding, it is usually assumed that R1= (1/2)Req1. - Similarly it is assumed that XL1 = X'L2 although it is strictly not true. Since the value of % R is much smaller than % Z, practically percentage reactance (% X) is taken to be the same as percentage impedance (% Z). 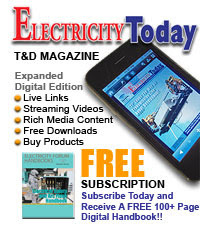 This approximation may not be true for very small distribution transformers. I like your article; we are providing information about in Short circuit analysis is performed so that existing and new equipment ratings were sufficient to with stand the available short circuit current. This short circuit analysis can be done either through hand calculations or through known software like NEPLAN. 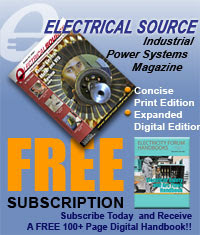 Please visit our website Short Circuit Analysis .